The ATT supports SAP versions 3.0d and up, including ECC 6 and ECC 7. 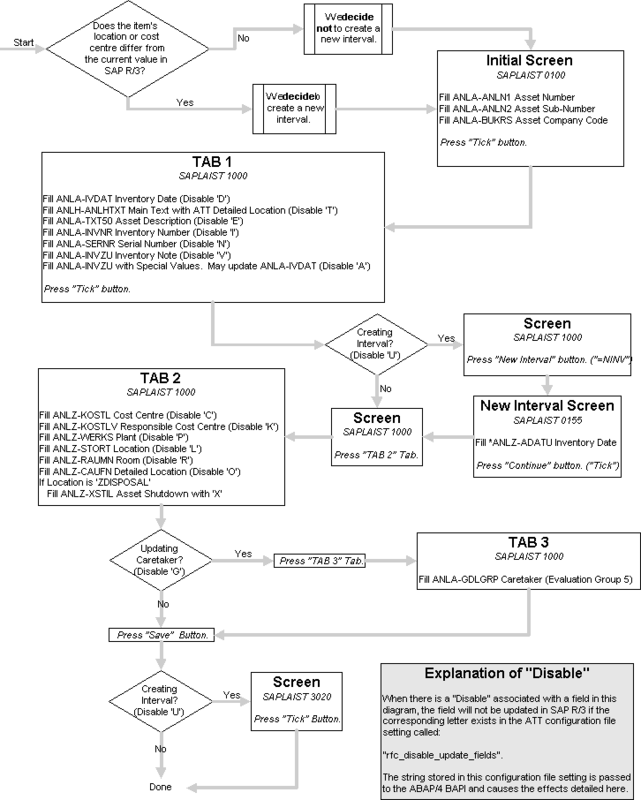 The ATT solution includes an ABAP/4 function module that is Remote Function Call (RFC) supported as illustrated in the diagram. This function module retrieves the requested data from the SAP Fixed Assets module or the SAP Plant Maintenance module (for plant equipment). The diagram below displays the components involved in the communication between SAP R/3 and the ATT software. Assets or Equipment may be down loaded in subsets.Three selection criteria are used to select the desired subset.These criteria are determined at installation time and stored in a configuration file. Any three of company code, class, location, plant, and cost centre may be configured as the available criteria, in any desired order. Multiple subsets may be selected for separate sequential ranges of criteria. The down loaded data is then checked for records that contain duplicate identifier field values. If bar code labels are the host’s inventory numbers then ATT checks for records that contain duplicate inventory numbers to ensure each item scan will relate to only one record. The same check is performed if bar codes are the host’s asset/equipment numbers. The ATT updates SAP asset or equipment information by calling a TIG International ABAP/4 function module that utilises a BDC session to update each asset or equipment, one by one, as shown in the diagram to the right. Each asset or equipment will invoke a new BDC session. Any assets or equipment that fail to update will be listed at the conclusion of the update session. Fixed Assets are updated using SAP transaction AS02. ORDTX 30 Evaluation group short description.